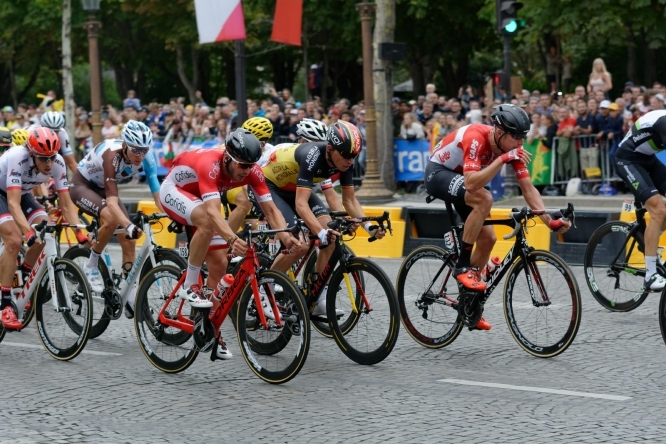 A total 176 riders are due to line-up on Saturday afternoon at the Grand Depart of this year's Tour de France in the Vendée. The rider list includes defending champion Chris Froome, who leads Team Sky on his search for a fifth title, and a record-equalling fourth in a row - less than a week after a chaotic 36 hours in which in participation was briefly in doubt. But, once world governing body the UCI dropped its anti-doping case against him, race organisers ruled that it had no reason to bar him from entering. Ahead of him, his seven Team Sky compatriots and the 22 other eight-rider teams, lies a gruelling 3,351km of racing over 21 stages of the three-week race. In that time, they will travel through 579 towns, villages and cities - from the 705-inhabitant Montvalezan to the 2.25million-population Paris - visit 36 French departments, and head into Spain for a 15km section of stage 16 between Carcassonne and Bagnères-de-Luchon. The race will start at close to sea level at Noirmoutier-en-l'Île, Vendée, and reach 2,215m above sea level at its highest point, Col du Portet, during the Pyrenees portion of the race. The ninth stage between Arras and Roubaix sees the return of the dreaded cobbles. The stage will include 15 sections of cobbled road ranging from 500m to 2.7km. In total 21.7km of the stage will be cobbled. As the final stage is traditionally a procession to Paris, the winner of the 105th edition should be all-but crowned after the 20th and penultimate stage, a time-trial between Saint-Pée-sur-Nivelle and Espelette - a distance of 31 kilometres. Meanwhile, following a three-year absence, a team time-trial of 35 kilometres will also be on the menu during stage three in Cholet. Some 7,000 hours of coverage will be broadcast, while rights to the race have been sold to 190 countries, including - for the first time - India. As well as a massive global TV audience, between 10million and 12million people are expected to line the routes for an average of six hours and 30 minutes - while every day's pre-racing procession will be 11km long and take 30 minutes from start to finish.